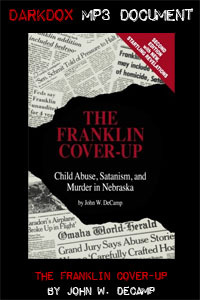 Conspiracy of Silence is the never officially released Discovery Channel documentary about The Franklin Cover Up Case (also known as “The Franklin Scandal”) involving human trafficking, pedophilia, ritualistic abuse of children, murder, government cover ups, the Bohemian Grove, Hunter S. Thompson, Lawrence King, and author of The Franklin Cover Up, Satanism & Murder in Nebraska; John Decamp, and many other prominent U.S. political figures. Download the ZIP archive of the film, book, and more here (1.27GB ZIP folder). These interviews, film clips, and documents are disturbing and detailed. This is one of the largest and sickest cover ups that, in our opinion, is a corner stone in the globalist, Illuminati, government corruption, church corruption agenda.